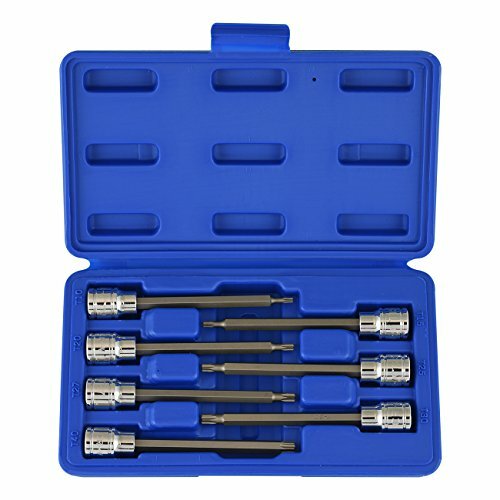 The extra long torx bit socket set is great for a wide range of applications ranging from computer parts, automotive, and even furniture that have special torx screws. The bits are made out of premium S2 steel and sockets are constructed of chrome vanadium steel for extra strength to remove any stubborn and hard to reach fasteners efficiently. The chrome finish makes for a beautiful shine that wipes clean and resists to rusting. The set comes with seven sizes ranging from: T10 T15, T20, T25, T27, T30, T40 that are engraved for easy identification and stores away in a carrying case.